Suzi Sheffield and Atlanta’s Beautiful Briny Sea have taken the grand prize at the University of Georgia’s 2019 Flavor of Georgia Food Product Contest with their product Gunpowder Finishing Salt, a tangy mix of Hawaiian volcanic salt, chipotle, black pepper, garlic, onion, sumac and some other secret ingredients. 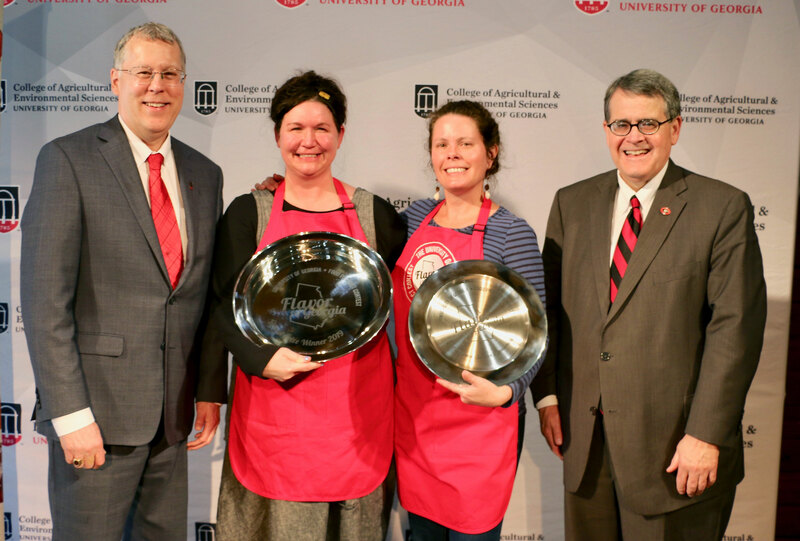 President Jere W. Morehead and College of Agricultural and Environmental Sciences Dean Sam Pardue congratulate Suzy Sheffield of Atlanta’s Beautiful Briny Sea and Holly Hollifield on their grand prize win at Flavor of Georgia 2019. A team of food industry experts and grocery buyers chose Beautiful Briny Sea, an artisan dry goods company that makes small-batch salt blends, sugars and other culinary products, as the best of 33 finalists. They rated the products on qualities including innovation, use of Georgia theme, market potential and flavor. In addition to the grand prize, Beautiful Briny Sea also won first place in the Sauces and Seasonings category. UGA College of Agricultural and Environmental Sciences Dean and Director Sam Pardue congratulated the category and grand prize winners during Flavor of Georgia Day, part of Georgia Agriculture Awareness Week, at the Georgia Freight Depot in Atlanta. In just over a decade, the Flavor of Georgia has had more than 1,400 entries from every corner of the state. “These small starts and big dreams have become big business. Flavor of Georgia winning products are now found not just around the Southeast, but across the nation as well,” Pardue told the Flavor of Georgia awards audience. For more information about Beautiful Briny Sea, visit www.beautifulbrinysea.com. 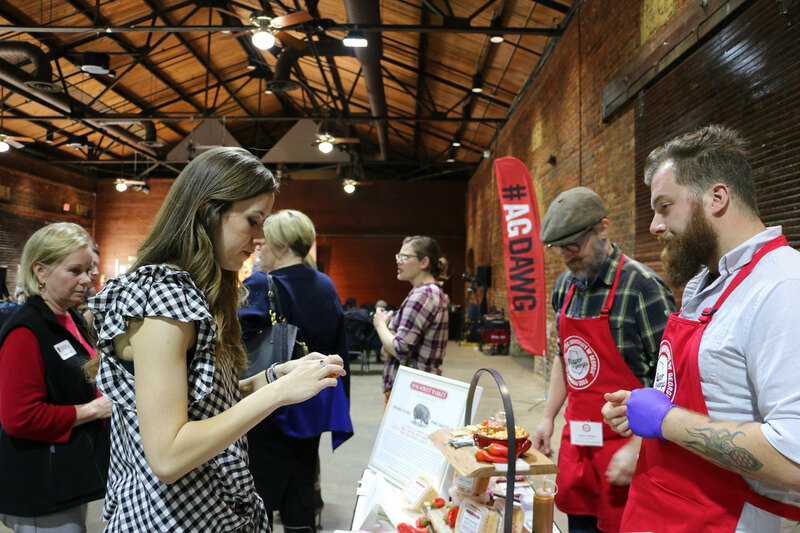 Showcase events like the 2019 Flavor of Georgia Food Product Contest help entrepreneurs spread the word about their products. Many participants have landed spots in regional and national grocery chains like Whole Foods, Ingles, Fresh Market, Earth Fare, Kroger and Harvey’s. Category winners received an award and membership in the state Department of Agriculture’s Georgia Grown program, statewide notoriety and bragging rights. All winners and finalists earn the right to have their products stamped with the 2019 Flavor of Georgia logo. They also gain exposure to grocery buyers and food industry professionals who judge the final round of the contest. The Flavor of Georgia Food Product Contest is organized by the UGA CAES Center for Agribusiness and Economic Development with support from the Office of the Georgia Governor, Georgia Department of Agriculture, Georgia Grown, Gourmet Foods International, the Georgia Agribusiness Council, Nadine’s Classic Cuisine and Georgia CEO.